Initially starting as a solo EP idea in 2015, willed into existence by Finnish producer Herman Prime aka Jon Thureson, Maajo (soundcloud) later expanded to include a whole troupe of musicians (five of them to be exact). The following year, their debut full length album, “Tropical of Tulli”, was released to great fanfare. Their sound can be described as a mesh of afro, disco and dub, intricately managing to weave their organic instruments into a mesh with electronic elements, neither one overpowering the other. One more turn around the sun and the remixes, which you just knew had to come, were released with contributions from some diverse, yet highly sought-after sources; namely Call Super, Luke Vibert and Dengue Dengue Dengue. We were anxiously awaiting some fresh material from the group and we were really excited to get our hands on the next EP from Maajo, once again being released on the mysterious Queen Nanny Records, a label named after the Jamaican national hero which launched alongside the band’s debut LP. Defo is the title and is also the lead track which we are premiering today. 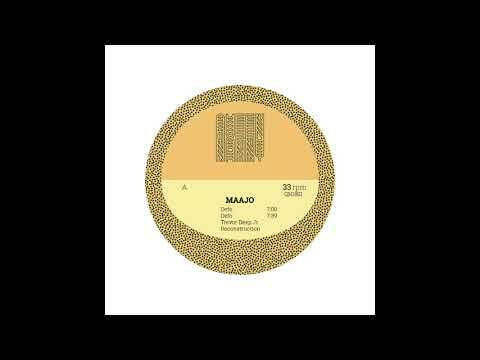 Bringing back their signature afrodisco sound, Maajo take a slightly deeper turn while still retaining their unique identity. At times the polyrhythmic track seems to be building in a more upbeat sounding direction led by the climbing bass, groovy percussion and guitar stabs but then the dub-techno-like chords bubble to the surface, a contradiction that you think shouldn’t work but in actuality is pulled off brilliantly. All the other usual suspects are present too, with plenty of tropical sounding instruments, vocals and atmospherics, as well as the make you want to dance rhythm that is pulled off so effortlessly. We’re hoping this little EP is just a sampler of another full length album that’s on the horizon. Don’t forget to check the other two tracks on the EP, one a Trevor Deep Jr reconstruction (and how deep it is), as well as the lengthy and trippy B side Mansaba. Set those Juno release reminders!